Winner of the 2013 Dr. James I. Robertson, Jr. Literary Prize Award, given by the Robert E. Lee CWRT of Central New Jersey. William “Extra Billy” Smith, the oldest and one of the most controversial Confederate generals on the field at Gettysburg, was also one of the most colorful and charismatic characters of the Civil War and the antebellum Old South. Despite a life full of drama, politics, and adventure, until now very few books have been written on Smith since a biased account in the 19th century by his brother-in-law. 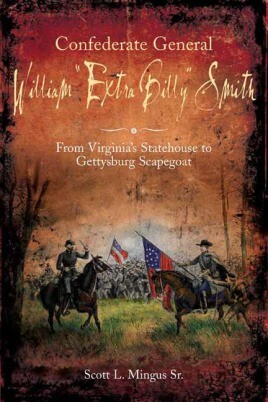 Scott L. Mingus Sr. has ably filled this historical void with Confederate General William “Extra Billy” Smith: From Virginia’s Statehouse to Gettysburg Scapegoat. Known nationally as “Extra Billy” because of his prewar penchant for finding loopholes in government postal contracts to gain extra money for his stagecoach lines, Smith served as Virginia’s governor during both the War with Mexico and the Civil War, served five terms in the U.S. Congress, and was one of Virginia’s leading spokesmen for slavery and States’ Rights. Extra Billy’s extra-long speeches and wry sense of humor were legendary among his peers. A lawyer during the heady Gold Rush days, Smith made a fortune in California and, like his income earned from stagecoaches, quickly lost it. Despite his advanced age Smith took the field and fought well at First Manassas, was wounded at Seven Pines and again at Sharpsburg, and marched with Lee’s Army of Northern Virginia into Pennsylvania. There, on the first day at Gettysburg, Smith’s frantic messages about a possible Union flanking attack remain a matter of controversy to this day. Did his aging eyes see distant fence-lines that he interpreted as approaching enemy soldiers—mere phantoms of his imagination?—or did his prompt action stave off a looming Confederate disaster? What we do know is that his calls for support diverted limited Confederate manpower away from attacks against Cemetery Hill and Culp’s Hill that might have turned the tide of Southern fortunes in Pennsylvania. Mingus’s biography draws upon a wide array of newspapers, diaries, letters, and other firsthand accounts to paint a broad, deep, and colorful portrait of one of the South’s most interesting leaders and devoted sons. Complete with original maps and photos, Extra Billy Smith will satisfy anyone who loves politics, war, and a story well told.